The moment Jumia made history. Jumia’s historic initial public offering has gone live trading on the New York Stock Exchange—and its stock shot up. After the ceremonial ringing of the NYSE bell by company executives, Jumia’s first official day of trading on the New York Stock Exchange began. And, as investors specialized in backing e-commerce companies in emerging markets predicted to Quartz Africa, Jumia garnered investor interest and enjoyed an impressive first day run. 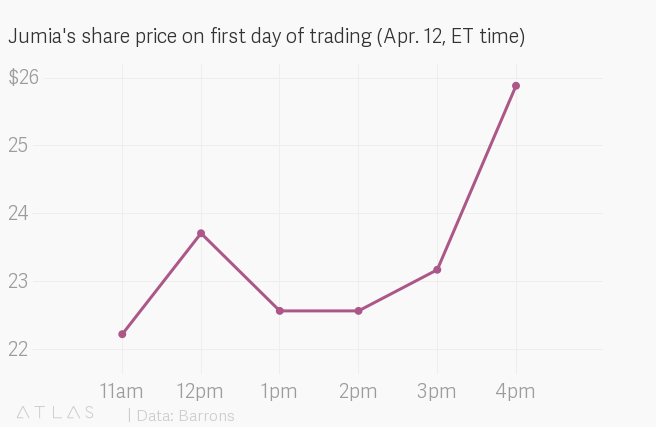 Its stock, which was priced at $14.5, closed up 75%. While the sharp jump on its first day of trading signals a positive outlook from investors, it is by no means a permanent trend as another recent high-profile tech IPO proves. After launching amid strong interest and gaining on its share price on its first trading day, ride-hailing company Lyft has broken its IPO price just two weeks after its launch. The listing is a watershed moment for Africa’s tech ecosystems as Jumia, the largest e-commerce company on the continent with operations 14 countries, is the first Africa-focused tech company to launch on NYSE or any major global exchange—and that novelty was played up throughout the launch event.